Last night in the Evening Standard there was an advertisement for a new paper; I suppose that as the Standard is London only and in the evening they don't see the start-up as direct competition. 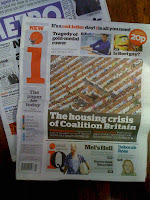 Welcome the first new daily paper in a quarter of a century (or thereabouts). 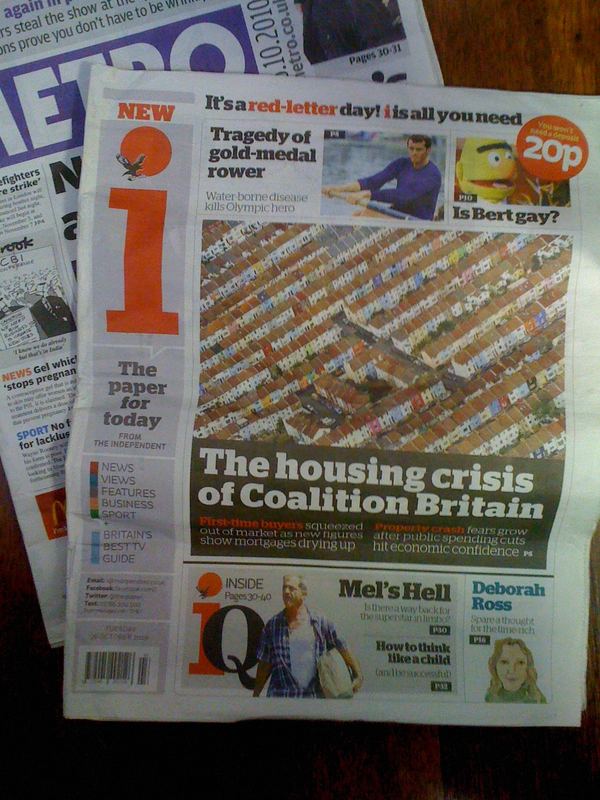 It's from the people who bring you the Independent and it's called "i". A paper for "time-poor" people. 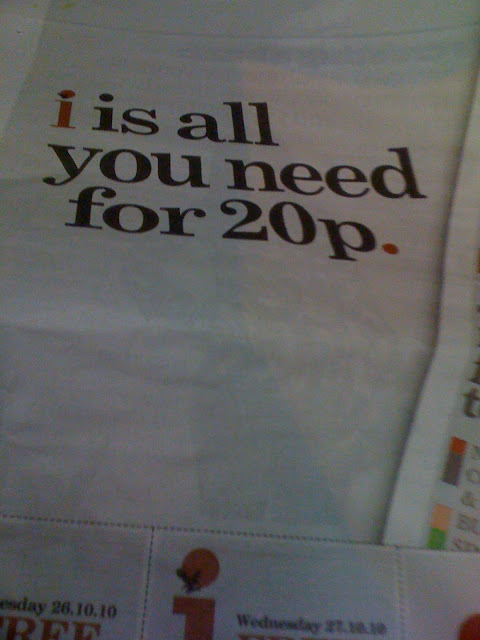 My first reaction was - why would I pay 20p for something I can get for free? There were vouchers in the Evening Standard to get the paper for the rest of the week so I thought - why not? Of course today is Tuesday so there wasn't much point me taking Wednesday's voucher this morning, so I still paid 20p. First reactions. A good size paper. Lasted me from waiting at the bus stop until just around Green Park. Unfortunately still not in the style of the London Lite with ink that doesn't come off on your fingers and a longer read means dirtier fingers! The layout is good - I liked the colour coded sections; I like the little "i" boxes with extra info and I liked the TV guide sorted by 'what you like to watch'. I didn't much like the journalistic style I found it a little more informal than I would usually expect in a newspaper; in an article about mortgages "lending grew by a measly £1.6bn in September" - I think I expect less adjectives and adverbs in formal writing. Pretty much my only complaint though. Not as much advertising as I thought there would be... not enough letters, but I suppose that is a bit much to ask in your first edition! !